Lamb traces the self-discovery of David Lamb, a narcissistic middle aged man with a tendency toward dishonesty, in the weeks following the disintegration of his marriage and the death of his father. Hoping to regain some faith in his own goodness, he turns his attention to Tommie, an awkward and unpopular eleven-year-old girl. Lamb is convinced that he can help her avoid a destiny of apathy and emptiness, and even comes to believe that his devotion to Tommie is in her best interest. 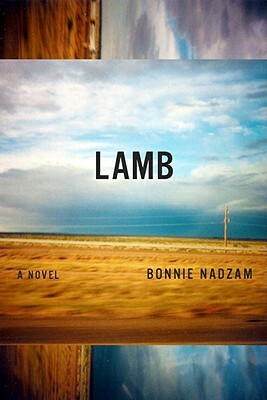 But when Lamb decides to abduct a willing Tommie for a road trip from Chicago to the Rockies, planning to initiate her into the beauty of the mountain wilderness, they are both shaken in ways neither of them expects. Lamb is a masterful exploration of the dynamics of love and dependency that challenges the boundaries between adolescence and adulthood, confronts preconceived notions about conventional morality, and exposes mankind’s eroded relationship with nature. Bonnie Nadzam was born in Cleveland, went to high school in suburban Chicago, and has moved continually westward since then. She studied English literature and environmental studies at Carleton College, and earned an MA and PhD from the University of Southern California. Her fiction and poetry have been published in The Kenyon Review, The Mississippi Review, Story Quarterly, Callaloo, The Alaska Quarterly Review, and others. She taught at Colorado College, where she served for two years as the Daehler Fellowin Creative Writing. She is married to her childhood love and lives with him in the Rocky Mountains.